One of CAAFI®'s goals is to foster the near term development and commercialization of sustainable jet fuel. This fostering takes many forms, and is evident in the individual action programs of our Work Teams, to our engagement with ASTM qualification efforts, to facilitating the development of offtake agreements between producers and airlines. One of our more targeted efforts is focused on the development of potential production concepts in very discrete cases where some of the elements of success needed for a project might be available, but all of the pieces have not yet come together. We call these efforts State Initiatives. These efforts support and complement the Farm to Fly 2.0 Initiative and the FAA's ASCENT Center of Excellence. What are the CAAFI state initiatives? CAAFI works closely with stakeholders to help develop local, state, or regional-level deployment initiatives for alternative jet fuels. Such initiatives are focused on bringing together representatives from all parts of a potential supply chain to evaluate, develop, and execute a specific deployment project—preferably the production of fuel and value-added coproducts. CAAFI is always looking for partners to discuss potential state initiatives, with the goal of having representative projects for various feedstocks or conversion processes in as many cases as we, and/or our collaborators, are able to support. Help identify local representatives or organizations (focals) who can coordinate efforts and drive an initiative forward. Support the focal(s) to establish a working proposal and success criteria for projects that represent clear targets of opportunity by surveying feedstock availability, executing fundamental strengths, weaknesses, opportunities and threats (SWOT) analysis, developing relationship with potential collaborators, and selecting among opportunities to drive forward. Facilitate identification and development of remaining supply chain partnerships. Support and facilitate coordination efforts with relevant resources and funding authorities (e.g. USDA, state and local interests). Provide linkages to the CAAFI network of participants, including fuel producer companies and potential alternative jet fuel purchasers. In collaboration with several entities in the region, including local, state, and federal interests, CAAFI is working with Penn State University to formulate a broad approach for addressing the need to reduce nutrient loading of the Chesapeake watershed while simultaneously developing a range of feedstocks (perennials, cover crops) that could be utilized for fuel production. Ongoing efforts to develop concepts in conjunction with state and Colorado State University (CSU) interests and the National Institute of Food and Agriculture (NIFA) Coordinated Agricultural Projects (CAP) Bioenergy Alliance Network of the Rockies (BANR) project. CAAFI's Steve Csonka and Rich Altman, along with members of the Business Development team of Marubeni Corporation (a Japanese industrial conglomerate being introduced to opportunities in the Sustainable Jet Fuel sector), tour the MSW sorting facility in Hartford, CT. Evaluation of options for repurposing the existing Connecticut Resources Recovery Authority (CRRA) Waste-to-Energy facility in Hartford to a Waste-to-Fuels complex with the potential of supplying jet fuel for Bradley International airport. Initial feasibility studies were funded by a USDA Rural Business Enterprise Grant (RBEG), and were executed in collaboration with the Connecticut Center for Advanced Technology. The F2F2 project in Florida is pursuing the development of energy crop substitutes for hundreds of thousands of acres of fallow citrus fields (resulting from citrus blight and disease), using a USDA Rural Business Development Grant to evaluate project feasibility. The project was launched at the start of 2016, with a project announcement and initial stakeholder meeting of over 50 key contributors from farmers, state and local government, end customers, financing sources, and NGOs. End customers engaged in the kickoff included A4A, American Airlines, FedEx, Jet Blue, and military buyer DLA energy. Fuel processors engaged in the project represent multiple pathways that utilize sugar feedstocks. During the course of the 12 month project, the team will identify concepts for crop development and year-round supply chain definitions to enable jet fuel production. In addition to developing a model for a five year scale-up to support a dedicated production site, the plan also seeks an early payoff in achieving a first year demonstration of fuel production using pilot resources of the various project partners. Click here for a local news media video highlighting this project. In collaboration with Georgia Tech, efforts are underway to define two potential projects in the state aligned with interests of both lipid and forestry producers. The forestry project may take the form of a feasibility study of a hub and spoke system of production of fuel intermediates delivered to a final location in GA for final conversion to jet fuel. 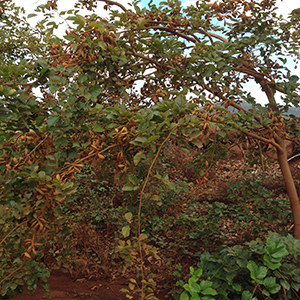 A nut-laden pongamia tree in a research field trial at the Hawaii Agricultural Research Center in Waipahu, HI, 2015. Photo courtesy of Steve Csonka. For several years, CAAFI has been active with members of the U.S. Pacific Command and their GIFTPAC program (Green Initiative for Fuels Transition PACOM) in evaluating the potential for feedstock production in Hawaii. In 2015, the FAA added the University of Hawaii to the ASCENT Center of Excellence Project 1 team to work collaboratively with other universities in ASCENT Supply Chain Analysis targeting tropical and sub-tropical feedstock opportunities. Feasibility analysis continues. In collaboration with several interests in the state, including Wenck and the Great Plains Institute, several concepts are being explored for subsequent execution as integrated projects. Participants of the Pennycress Workshop. Photo courtesy of Kayla Altendorf via Twitter. In the interest of investigating the potential for targeted agricultural synergies that could be aligned with aviation interests, CAAFI, in partnership with USDA ARS and several universities, has initiated workshops focused on the development of a winter cover oilseed, pennycress (Thlaspi arvense) that may fit with the corn/soybean rotation prevalent in the region, and be readily adaptable by farmers. Two feasibility studies funded by USDA RBEGs were recently completed focusing on use of woody biomass-based fuels (Clarendon County) and algae-based biofuels (Colleton County) near South Carolina's I-95 corridor. Results indicated that lumber industry by-product values remain competitive for fuel projects. Follow-up is being defined for the initial team to continue evaluations on the woody biomass concept, potentially through use of a USDA Value Added Producer Grant Proposal. This would be done in conjunction with several conversion technology providers, and would potentially include the evaluation of location-specific, brown-field sites including abandoned or underutilized pulp and paper or saw mill facilities. Participation is also expected from military customer interests in addition to CAAFI stakeholders in the region. Development of a pilot facility to demonstrate advanced biofuel production utilizing farm waste materials in an integrated system incorporating anaerobic digesters, heterotrophic algae, effluent clean-up, and fertilizer production. 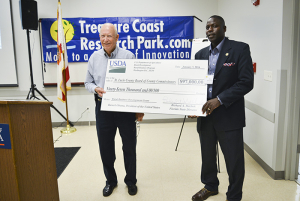 Initial feasibility study funded by USDA RBEG. Feedstock: Dairy and other waste streams (rural, industrial, municipal).